The last time I wrote for the Dry Dock in June, we were looking forward to the boating season to start for us as we had been away. It was early July when I got “Route 66” to the driveway to start watering her to get all the seams tightened up before launching. The battery was charged and after replacing all the water drain plugs and attaching the garden hose to the impeller, I started her up. First of all, I want to remind you that I have been winterizing this boat almost every year since 1966 and following the same procedure with successful results every Spring. When she lived in Ontario, she was stored in a boathouse, not insulated so subject to very cold weather. There was never a freezing problem. As you read “the rest of the story”, you will see that this season was not our most enjoyable and my short article will not have photos of us on the water or of boat show fun. Now, back to the story. I heard what sounded like water running and when I looked in the engine room, water was pouring out of a hole in the front of the engine so I shut her down and took a close look. It turns out that this was a frost plug that had popped during the winter. It was a round grey disc about the size of a Toony and was laying on the bottom. I had never seen this before so had no idea what might be involved in fixing this problem. I immediately placed a call to the Middletons and Bruce gave me a name of a guy he thought could help. I called Barry’s Mobile Marine Service, and for the next 2 1/2 weeks Barry’s mechanic custom made two frost plugs, ( yes there were two frost plugs that had popped ), replaced some water hoses and re-sealed a small leak in the manifold cover. 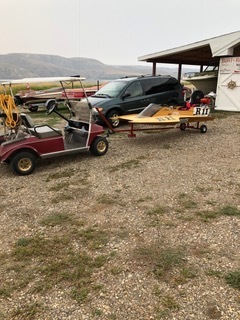 During the repairs and testing, the old battery gave up so I installed a new one and was now ready to get some time on the water. 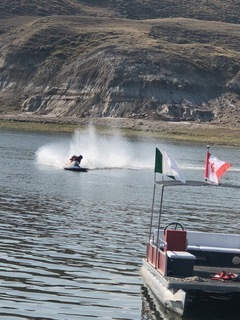 We launched at the Westbank Yacht Club ramp on July 25th for our first run down the lake. 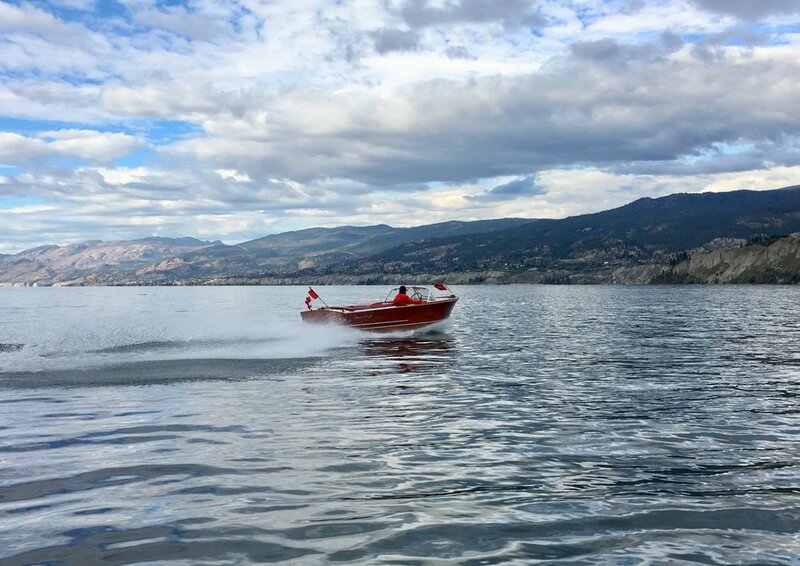 It was a beautiful day, lots of sun, lunch at the Blind Angler in Peachland, cruised almost to Summerland, meandered back on the East side of the lake and had about 5 hours on the water. The motor ran beautifully, as I would expect from a 53 year old motor with very few repairs over her lifetime. A great start to what we thought was going to be an even greater season. Oh, well, “the best laid plans of Mice & Men” - - etc.-. The smoke of the summer started to arrive and if we could not see the far side of the lake, we delayed launching. This carried on until the end of August when I came down with pneumonia that sideline me for our show at the end of September and still has me short of breath at times. I now prepared to winterize her. Having seen what can happen, I decided to add a new wrinkle to my shut-down plan. In addition to all the normal list, I attached my “shut down and start up hose” to the impeller and sucked anti-freeze from a 9 liter jug until the exhaust ran pink. I then poured Rizlone oil into the carbs to coat the cylinders, ( I always have done this ) and choked her off. So, there was our boating season for 2018. Memorable for the wrong reasons but what the heck, there is always next year. 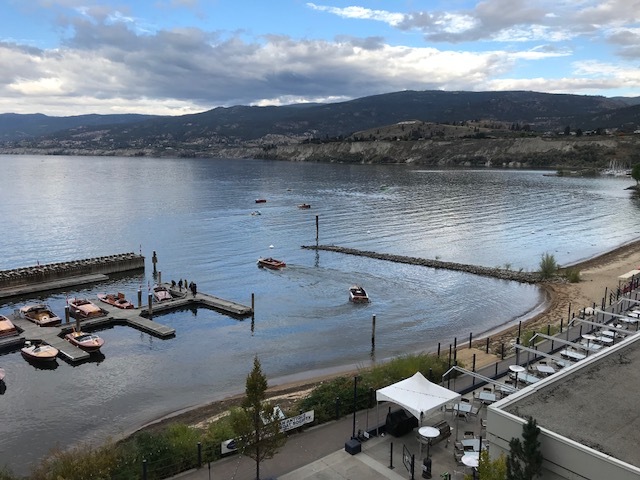 I want to thank the board for the way everyone jumped in to make our show in Penticton such a success. I have heard many good comments. It was a lot of effort to make the change in venue and I thank Jim Cooper for his chairmanship of the show. I look forward to next year’s show and with good luck, I will be there. In the meantime, have a safe winter season. Louise and I drove down to Gene Coulon Memorial Park, on the south end of Lake Washington where the PNW chapter put a one day show. It was a fun day with some amazing boats and some great people. The club offered free boat rides to the public and the line-ups never stopped all day. It’s a beautiful setting right in the city. At the end of the day they treated us to a delicious catered dinner under one of the parks gazebos overlooking the docks. This was the time when everyone came together and visited. The PNW chapter has a great bunch of friendly people who are wonderful hosts and made us feel welcome! The Highlight of our day…. was meeting Joie and her granddaughter, Alison. Joie’s Dad was the original owner of our Chris Craft Holiday. Back in 1954, Joie had talked her Dad into buying JoVon from his best friend for his newly acquired lake house on Lake Geneva,WI. 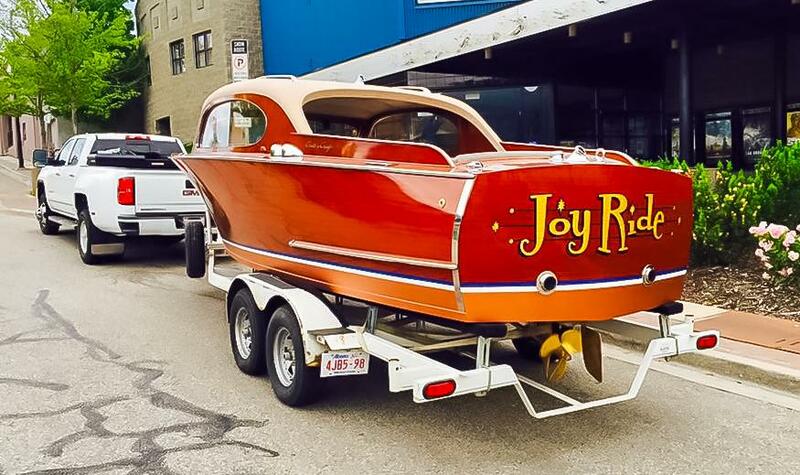 He named the boat JoVon, after his two daughters, Joie and Yvonne. Joie and Alison told us the boat was used on Lake Geneva up until the late 1960s when it was stored in Yvonne’s carport in the Chicago area. Joie as a young woman, learned to water ski behind the Holiday. JoVon sat in the carport until Joie and her husband, Denny brought her out to Seattle in the early 1990s. 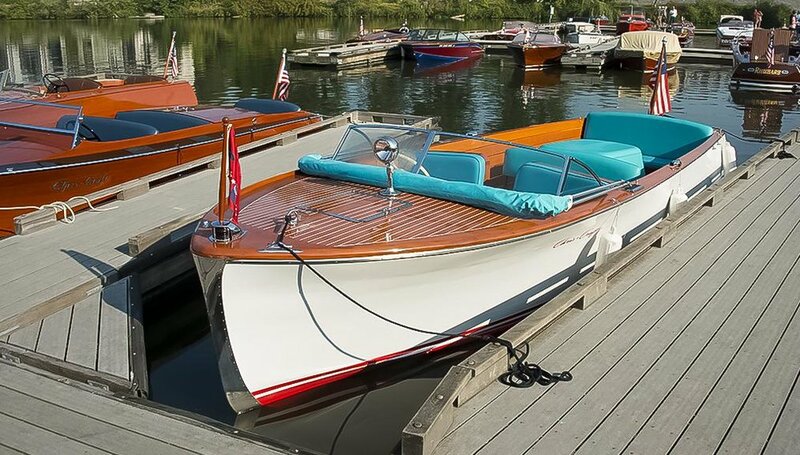 They stopped off at Syd Young’s of Stancraft Idaho, where Stan re-stained and re-varnished her as well as rebuilt the KLC engine and re-upholstered the interior. 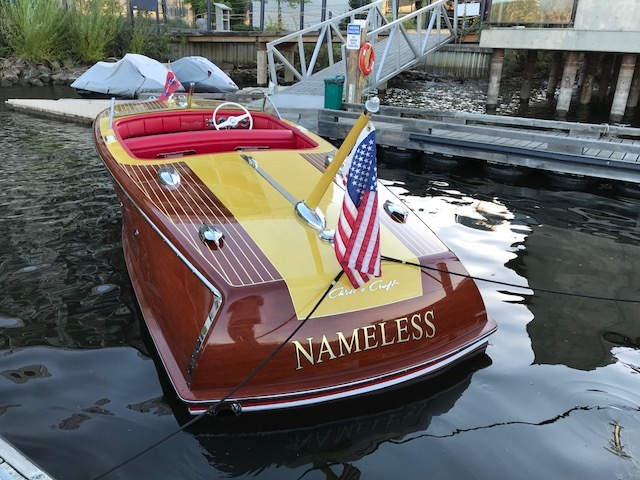 They continued to use the boat and build memories with their grandkids up until the boat was sold to a gentleman in Moses Lake WA. around 2011. We purchased JoVon from him last summer. I was able to touch up the stain and freshen up the varnish as well as some interior work, engine work, bottom paint and new floor. It was both an honor and a privilege to be able to take Joie, Alison, and Alison’s husband, Todd out for a ride. They both shared a lot of memories and stories with us. It was wonderful to meet them and get some history on the boat! What a wonderful lady, and at 88 years young, Joie is a firecracker! I was reminded that we really are just caretakers of these precious old boats when, upon saying goodbye, the last thing Joie said to me was “Steve, you take care of MY boat!”. Wanting to escape the forest fire smoke of the BC Interior, a last minute decision was made to head south. 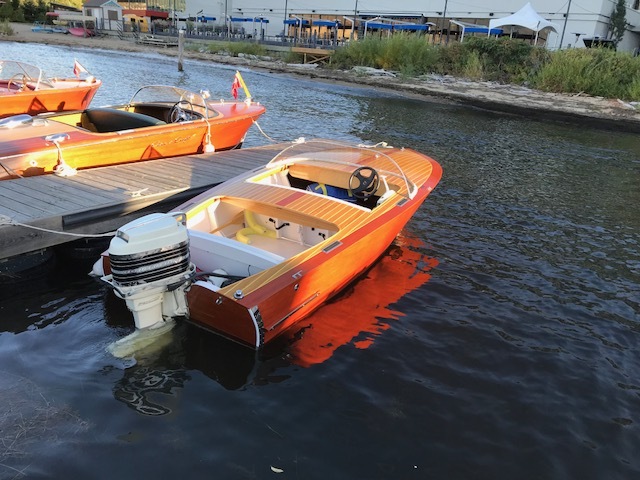 The Oswego Heritage Council & Columbia Willamette Chapter ACBS 2018 Wooden Boat Show was scheduled for August 18 and 19 and we wanted some sunny skies. The Joy Ride was on. Jenni Medina and I packed up the 1954 22’ Chris Craft Custom Sedan and headed down from the Shuswap, British Columbia. 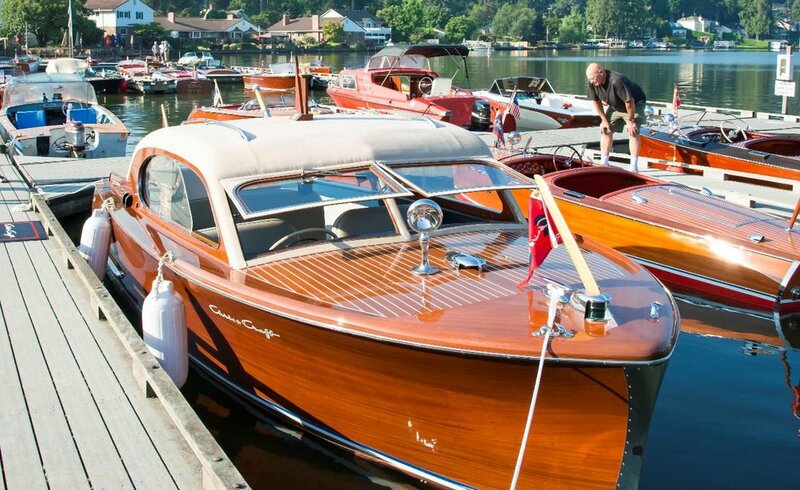 The Lake Oswego Boat Show was an impressive event. Special thanks out to Wendy and Bob Nelson for doing a wonderful job of organizing and hosting. The commitment of local sponsors made the event very inviting and reasonable in cost. There was an impressive selection of boats to view and the public turnout was very good. In addition to the boat show the Oswego Heritage Council ran a car show concurrently. 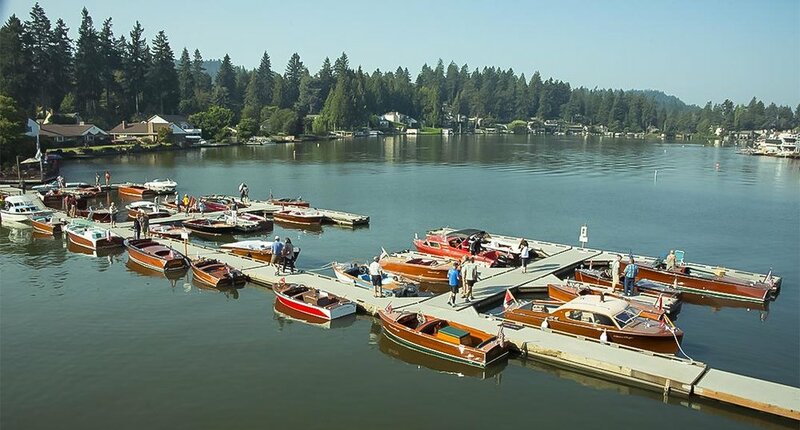 Lake Oswego is a small but very interesting city south of Portland Oregon with a private lake that was made from a naturally occurring channel of the Tualatin River that is now expanded to 395 acres. Development around the lakeshore started at the turn of the century and now includes some large estates, many of which have spectacular stone boat houses. The Lakeshore Inn overlooking the lake and the boat docks were very nice. There was a very good selection of shops and restaurants within walking distance. With a stroke of good fortune the wind direction changed and we had some warm sunny relatively smoke free days to enjoy. Joy Ride did well at the show and was awarded “Best Utility” trophy. I think that was a really big honor when compared to a U22 called “Mike” restored by Mike Mayer. 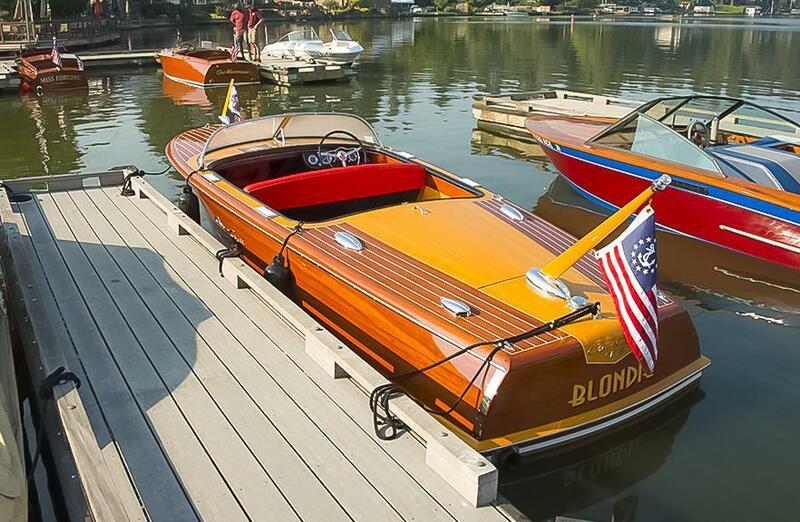 Warren and Tracy Olson were awarded the trophy for “Best in Show” for their 1955 21’ Chris Craft Capri “Blondie”. It was an honor to stand with Warren as he and Tracy had been very nice with us as we have begun venturing into the Pacific Northwest area from Canada for boat shows. The winner of the ‘People’s Choice” Award went to an excellent 1961 Shepard V-110 (Canadian built). It was brought from the PNW Chapter and is owned by Scott Mason and Patty Ludden. It was really nice to have another opportunity to show with them. Those Canadians did build some cool boats. Steve and Louise Leslie from Mission, British Columbia brought down their 1942 Chris Craft Special Runabout. This was awarded the trophy for “Best Amateur Restoration”. On the Friday before the show, the Oswego Heritage Council held a reception at the Oswego Heritage House Museum for boat show and car show participants and sponsors. The Heritage House Museum was a very charming venue for the social events, within walking distance of the Lakeshore Inn and docks. It was a great opportunity to meet some new people and chat with some previous acquaintances. 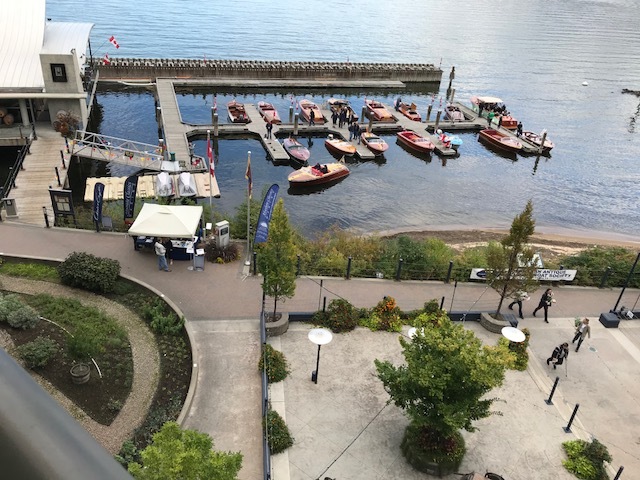 On the Saturday there was a wonderful catered banquet for the boat show awards presentation. The social events for this show were very well done and we were very happy to have had an opportunity to participate. Although I am not overly happy that we have returned to the smoky British Columbia interior, I am very pleased we made the decision to escape to the Lake Oswego Show. It was a very good show that we will remember fondly. Here are some additional participant photos from Lake Oswego! it was nice to get back on track and return to the Lakeside Resort for this years show! We had a great crowd with just under 20 boats. The quality of boats was outstanding! The wind was up on the lake Friday but we all managed to get settled in for an evening reception at the resort. I was glad to see so many members come even though some were not able to bring their boats. Members came from Washington, Alberta, Vancouver Island, Lower Mainland, and of course the Okanagan. 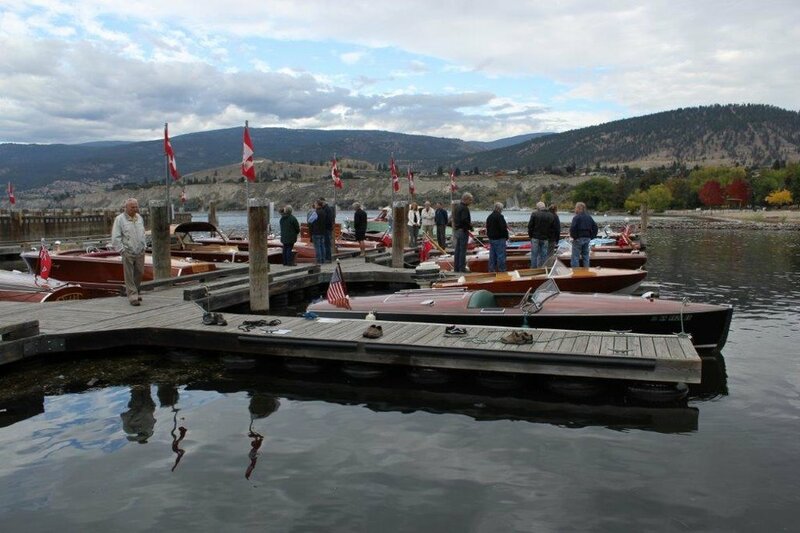 Saturday saw a large crowd enjoying the gorgeous collection of boats. In the afternoon, the winds calmed and everyone got out for several rides. Thanks to all those who gave rides to those that didn’t bring a boat. The entire group made a couple of passes by the resort. My wife, Louise saw it from the 5th floor balcony and said it was pretty spectacular! Saturday evening we boarded the SS Sicamous for an absolutely delicious catered dinner. The entire ship was open to us to wander around and take in the wonderful history of the largest boat registered with the ACBS! Jim Cooper is President of the society that looks after this ship. He has a dedicated team of enthusiasts that work tirelessly to keep her in the shape she’s in. They also helped out at the boat launch. Big thanks goes out to them! Sunday’s weather brought rain and a choppy lake so we had to cancel the cruise and drive to Summerland for brunch. No one’s spirit was dampened and we had a good visit with everyone. This was the first show that I’ve been involved with since being on the Board. 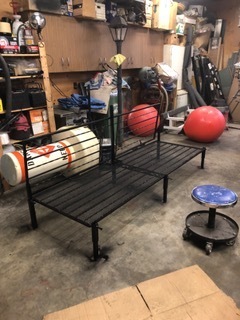 There is a lot of work and planning that goes into putting this on. Everyone did a great job and was always willing to help out! Thanks to everyone for a successful Show! It was a fun weekend with awesome people, beautiful boats, and a great crowd! We hope to see you all next year! Grant Greenslade, Peoples Choice, 1931 Dodge. Interesting to note that every boat in the show received multiple votes for Peoples Choice. Don’t have a good transom shot, but do have a story. Our boat is a 1954 27’ Shepherd. John and Jennifer Hindle , who were both wonderful characters, bought it in about 1961 and didn’t like the name and wanted to change it. Both also thought that it was very bad luck to rename a boat, soooooo….they landed on “Shepherd” after the builder thinking that that was not the same as changing her name! A little bit more history, it used to have the letters K.C.Y.C under the name. Which stood for Kipper Cove Yacht Club, which was the tiny harbour that they had at the original Eldorado Hotel (which they owned). This was very difficult to explain to folks who thought something was wrong with the letters…Kelowna ? Yacht Club all the way to Kansas City Yacht Club. While we like the quirky history in her big rebuild in 2008, we changed it to Okanagan Centre, where she now resides. This boat is stunning and fast! 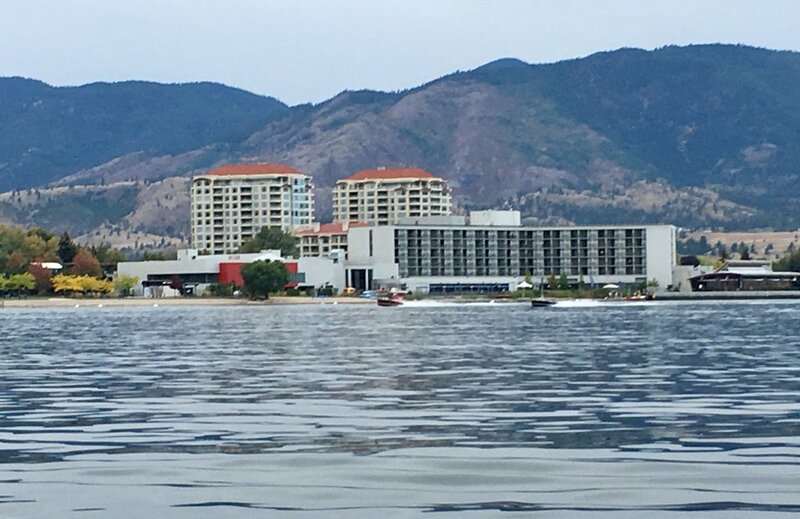 When everyone was out taking a fast pass by the Lakeside Resort at the Penticton show, Dev passed everyone like we were standing still with his two engines totaling almost 800hp! We met in Grade 4, graduated high school together and went our separate ways. We met again at our 30th high school reunion and married 3 years later. Our first dance at our wedding was to "Only You", The Platters hit song of 1954. It had become "our song." In 2016 we bought our beautiful 53 ft 1954 Chris Craft Constellation that Keith lovingly restored and we renamed her "ONLY YOU." Kerry teases Keith saying when the Platters sing "only you and you alone can thrill me like you do, you're my dream come true, my one and only you" Kerry thought he meant her but he's actually referring to the boat! started life in Washington State and was fondly named Mr. Toad, part of a family of boats with names originating in The Wind in the Willows books. Since arriving in Canada, the new name is el Bandito. Why? Because this little beauty will sneak up on you and steal your affection! It may not be the most glorious model or perfectly restored, but you will find your self unavoidably endeared to this craft. It is simply enjoyable to cruise, is relatively affordable and makes a boater out of non-boaters. 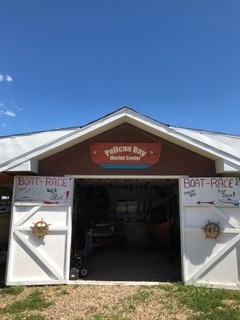 Pelican Bay is the name of our property at the lake on Travers Reservoir south of Calgary. We are on the little Bow River as it enters the reservoir giving us a small lake like body of water to race on. The 3 point hydros have been collected from around North America we have 7 in total. We are running Yamato 80 S which are Japanese dedicated race engines. They run at 7000 RPM and push these boats up to 60 miles per hour. We are currently putting the finishing touches to our race course, that is all the stuff you need to have to set up a course, ie buoys of various types for various purposes, flag system, safety gear including water stretcher, and this winter will build a 5x5 1 minute start clock. Our plan for 2019 is to run 4 races on the Sunday of each long weekend and to crown a seasonal high point champion at the last blast race on the September long weekend. We have a trophy which will be displayed year round at the club headquarters, The Lakeside Bar. Ian and Barb Fraser headed home on Monday after the show…. I maintain my boat, I maintain my engine but I admit not paying the same attention to my trailer. This little episode was a good reminder for several reasons. 1. I will forever more get my grease gun out after every time I launch my boat and add grease through the Bearing Buddies. 2. I will never debate again about putting my toolbox into my truck on long trips. If I had not put my toolbox into my truck on this trip it would have cost me at least $350 for a tow to Hope + $100 for labour (on top of parts) and probably a night in a hotel room in Vancouver. 3. I am buying a spare wheel, tire, hub and bearing-kit for my trailer and carrying them with me. Thanks very much to my wife Barb for her support and awesome umbrella holding to keep me dry during the many torrents of freezing rain at the Rest stop. And most importantly my Dad who taught me to go to each wheel during every stop and feel the wheels with the back of your hand to feel for heat. Had I not done this I expect we would have had a catastrophic failure a few miles later probably the wheel falling off. This summer has gone by so fast. The boats have been put away for the winter but its truly been an amazing summer! Louise and I were able to get to three shows where we saw friends and made new friends, in Portland, Seattle, and the Okanagan. The people in these three chapters are so genuine and friendly. Tyson and I met Marty and Kylie earlier this spring at a car show and signed him up to our club. We have all become boating buddies and help each other with repairs and maintenance. Escaping often for an evening boat ride or a weekend excursion. Its great going out with other club members and enjoying each others company and our boats together. This is what belonging to the OACBS and woody boating is about! Thanks Guys!